It seems like, every few decades, someone decides that it’s time for another look at Robert E. Howard’s barbarian warrior Conan. Although he first appeared in 1930s pulp stories, I became aware of the character in the early 80s, when the aptly-cast Arnold Schwarzenegger headlined the movie and its sequel. That film also comes to Blu-ray for the first time next week on August 2. 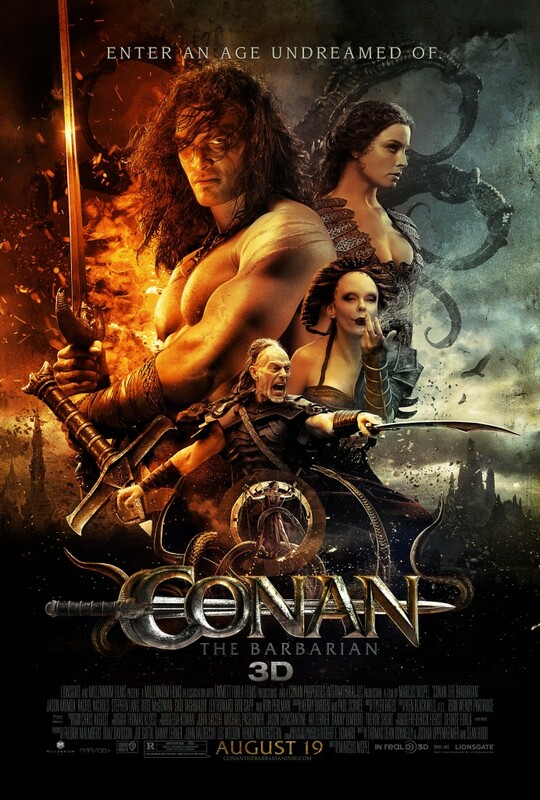 CONAN THE BARBARIAN IN 3D, starring Jason Momoa, Ron Perlman, Stephen Lang, and Rose McGowan, follows Conan’s quest across the continent of Hyboria as he fights to avenge the murder of his father and the slaughter of his village. The red-band trailer (age-restricted) has been posted if you want to check out the gore. Dark Horse Comics, which currently has the license for Conan in comics, is making some digital specials available. The movie adaptation The Mask of Acheron is now online for $3.99 for 59 pages, available on the web or via Apple’s App Store. Also, this weekend, classic Conan (originally published by Marvel) will be on sale for 99 cents each.